My kids’ school has a healthy snack policy. I’ve even had snacks returned for quote “not being healthy”. The downside to this is eventually kids get tired of the yogurt tubes, cheese strings and granola bars that tend to be the go to, affordable, nut-free selections when we go grocery shopping. When I was younger I loved to bake. It was probably the thing in Home Ec that I liked to do the most. One comfort I take from baking is that it often requires a solid measuring process. It really isn’t go by your whims and going by my whims is usually when I fumble the most with cooking. I plan to touch on my not so successful moments as I go along. So it dawned on me that maybe I could start baking one night a week, something different yet still healthy, that could be an ideal size for my kids to take to school and get them out of the snack routine they have found themselves trapped in. Also I could use this time to expand my baking skill back to where they used to be. I should also preface this part by saying I am a huge fan of “Cozy Mysteries”. Nothing better than a warm cup of coffee, a fuzzy blanket and a mystery tied into food. Often there are recipes enclosed in the back of the book. If you would like to learn more about the different types of Cozy Mysteries that are out there and the recipes you can expect to find from their authors please check out The Mystery Lovers’ Kitchen. My recipes for this week’s experiments came from Cleo Coyle’s book A Brew To A Kill. I made her Oatmeal Cookie Muffins and (Healthified) Blueberry Pie Bars. I’m going to start with what I learned from the Oatmeal Cookie Muffins. First off always read the recipe before you actually start. The type of oats you use in this recipe matters and Cleo is always great about putting in good notes about ingredients. It is one of the reasons I enjoy cooking from her recipes. The Oatmeal Cookie Mini Muffins about halfway through my evening of baking. Second buttermilk soaked oats make for really moist muffins. Third it might be best to buy the parchment paper liners for my muffin tin next time. The cute ones from Dollarama stuck quite a bit despite the fact that I took Cleo’s advice and sprayed the liners with non-stick cooking spray. Fourth I probably didn’t need to double the recipe as I went with my mini muffin tin and ended up with 6 dozen mini muffins. Luckily I had friends who were working all weekend and so I dropped off 3 dozen to them on Friday. I haven’t seen them to get their review of it yet. I did find this recipe easy to work with. The batter came together easily and even my picky hates raisins kid gave these a thumbs up. They taste just like a chewy oatmeal raisin cookies and are low in fat and high in fiber. The mini muffin size made it perfect for lunch kits, on the go snacks and perfect for 3 year old hands to enjoy. Very happy with these. I will make them again but next time I am going to try a standard sized tin just to see the difference. 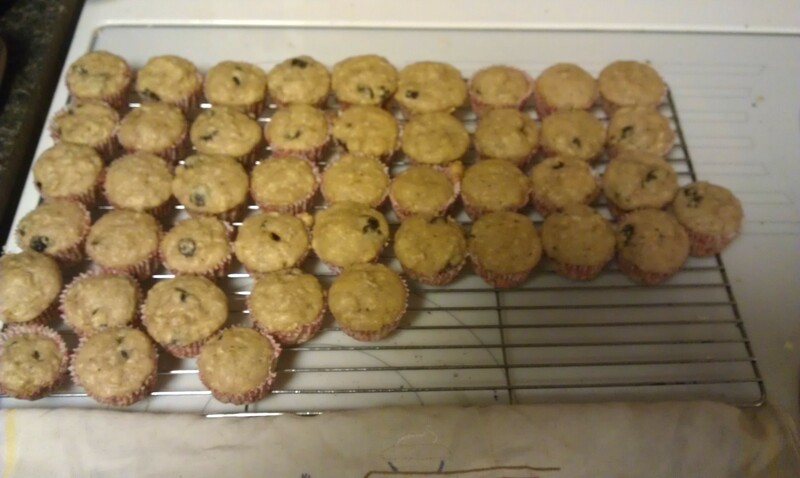 I produced about 6 dozen mini muffins in about 45 minutes. Took about 10 minutes to bake in my oven. 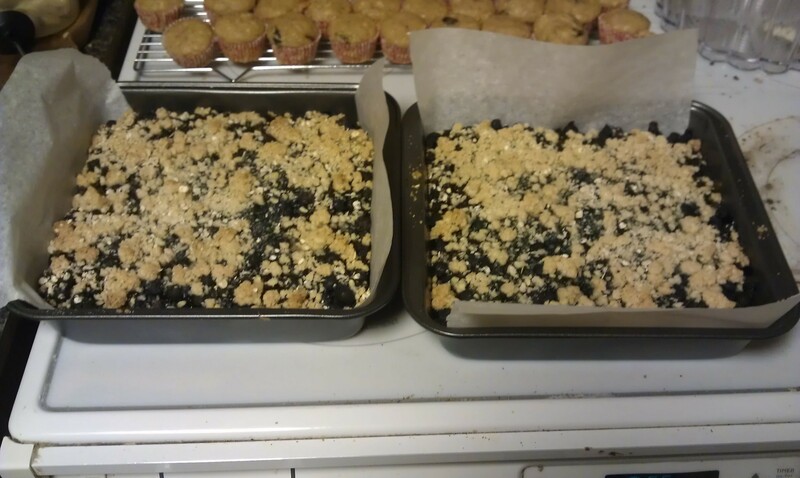 What I learned from the (Healthified) Blueberry Pie Bars. First frozen blueberries work really well in this. I wasn’t sure because sometime being frozen can be affect the taste of some foods. I wonder if it is the process they use to freeze sometimes. Second always check to make sure you have enough ingredients. I lucked out with just enough brown sugar to make the two pans I planned on but it might not have been so lucky. Third that parchment paper trick you see in the photo is awesome. Though my husband uses it pretty regularly when he cooks but this was my first time using what I am going to dub as “The Handle Technique”. Those long pieces of parchment made it easy to take the bars from the pan to my cutting board. Fourth there is a really great flexibility about this type of baking. I can make small bars perfect for school lunches or bigger slices that I could serve in a bowl with a scoop of ice cream in a pie a la mode way. Fifth a good hand mixer makes all the difference. My previous hand mixer was a Black and Decker and while no offense to them it didn’t have a slow or gentle speed on it. It pretty much went from 0 to 60 on the 1 setting. It recently bit the big one and we have upgraded to a Kitchen Aid Artisan hand mixer and I love it. The speed variation is nice and 1 actually means not throwing up bits of butter and sugar when you are trying to cream them. Overall very happy with these two choices and my kids were happy with something different to put in the lunchbox. Esp something with blueberries. If you would like to know more about Cleo Coyle and check out her books, recipes and she will even teach you how to make a better cappuccino please head on over to The Virtual Village Blend. Posted on January 21, 2013 by Shirley Robert	• This entry was posted in Cooking with Kids, Recipes and tagged baking, Cleo Coyle, cozy mysteries, cozy mystery, food, healthy, kids, mini muffins, Mystery Lovers' Kitchen, oatmeal cookie, rut, school, snack. Bookmark the permalink.